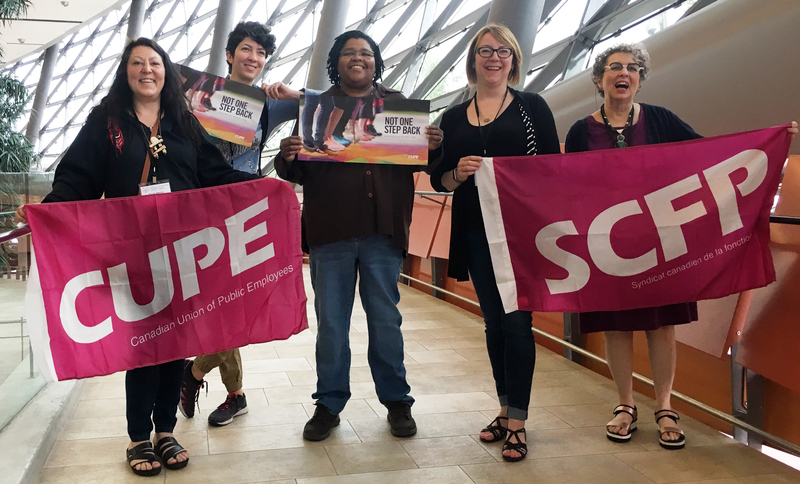 CUPE members proudly attended the first-ever National Women’s Shelter conference in Ottawa, June 13-15, 2018. The delegation included women’s shelter workers from across Canada representing decades of front-line experience who are celebrated for the difficult and important work they do to support women and children fleeing violence. Representing CUPE were Paula Gerrior, CUPE 4459; Sharon Llewellyn, CUPE 79; Nazanin Moghadami, CUPE 1936; Debbie Turner, CUPE 3762; and Karen Van Leusden, CUPE 2348-07. Our members are experts in naming and addressing the systemic barriers faced by service-users and workers alike. As one member says, “In spite of everything, we cannot break.” Workers who work against violence against women (VAW) often withstand “vicarious trauma,” the upset one can experience upon hearing about another person’s ordeal. They overcome bureaucratic blocks, limited funding and difficult working conditions – and still, our members do not break. They selflessly provide comforting, effective and affirming support to women and their families and play a critical role in building the Canadian shelter movement. The delegation highlighted the need for increased public funding and a national action plan on violence against women, safe and decent working conditions, supportive management and adequate and stable pay. Conference participants recognized the need for more VAW shelters and services to reflect and respond to the needs of diverse women, including racialized women, Indigenous women, trans women and women with disabilities. The slogan, “Nothing about us without us,” echoed throughout the halls and drove home the point that shelter workers and service-users need to be part of the design, decision-making and implementation processes that ground this work. Shelter workers, organizations and VAW advocates recognized recent steps by the Liberal government to address VAW but see them as small steps that do not go far enough. The United Nations called on states to implement a National Action Plan by 2015. To-date, the government has failed to comply. The Canadian shelter movement continues to call for a comprehensive, coordinated and effective National Action Plan on Violence Against Women that includes federal, Indigenous, provincial, territorial and municipal levels of governance. We remain proud of our members who are part of a vibrant, active shelter movement. We look forward to continuing to support their work as they strive for more equitable and responsive workplaces that put the experiences of women and children fleeing violence at the centre, while also protecting the rights of shelter workers.